We invite you to join Remote River Expeditions on this unique adventure to discover the 'Great Red Island' and the joys of river camping. And, of course, lemurs, chameleons, baobabs, orchids, exciting birds, bizarre spiny desert, beautiful forest, and the endearing Malagasy people. An active yet leisurely paced adventure, we investigate a variety of ecosystems and a wonderfully remote river journey on the Mangoky River. 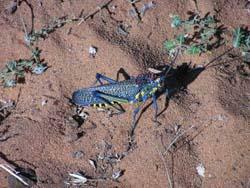 A premier destination for lovers of wildlife, Madagascar is a safe and wonderful place to visit. 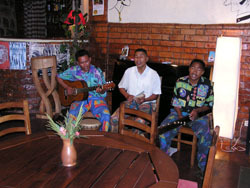 Phenomenal in its uniqueness, Madagascar's natural beauty is visually sensational. Featured in the book: 1,000 Places to Visit Before You Die by Patricia Schultz Our journey begins with a visit to the rainforest reserve of Andasibe-Mantadia (Perinet), the best place to see and hear the Indri-Indri, Madagascar�s largest lemur. Our walking safari in the primary forest also reveals bamboo lemurs, numerous endemic birds,and a great variety of orchids, fern trees, pandanus and palms. On a night walk we explore the area near our hotel for nocturnal lemurs, birds (nightjars & owls), and chameleons. 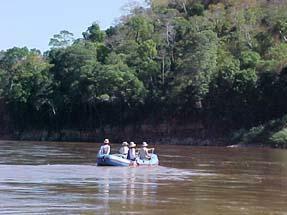 Returning to Antananarivo we fly to Toliara in the southwest and begin our overland journey to the Mangoky River. We travel eastward overland to Sakaraha, where we head north leaving the tarmac on a sandy track that crosses the Fiherenena River and follows a plateau dotted with huge Mahafaly tombs to the banks of the Mangoky River. 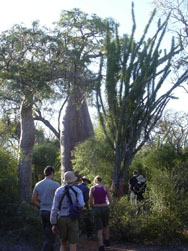 The dry deciduous forests along the Mangoky River are vast, unexploited, and probably include the largest baobab forest in the world. The banks of the river are sparsely inhabited, and the few villagers we encounter are friendly and non-intrusive. No trip in Madagascar is complete without lemurs: the Mangoky offers Verreaux's sifaka clinging to baobabs, red-fronted lemurs scuttling along branches, ring-tails peering down from sandstone cliffs, and nocturnal species we spot by flashlight. We see peregrines nesting at the Ampandra confluence, Madagascar buzzards, cuckoo-rollers, and many herons (gray, purple, Humblot's squacco, green-backed, plus great white and dimorphic egrets). Knob-billed and white-faced whistling ducks congregate in flocks of up to one thousand. Our campsites are great expanses of pure white sand, bordered by forest, with grand panoramas of river, hills and sky. There's plenty of firewood, bathing is easy and safe, and the forest margins invite individual wanderings or nocturnal lemur-spotting. The climate is sunny and dry, with cool nights and the kind of fresh sweet air that makes you wake happy and ready to enjoy the day. 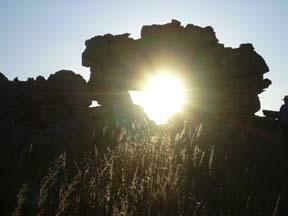 Proximity to the Tropic of Capricorn makes the spectacular sunsets linger the whole length of your first rum-and-lime. Remote? In the 160 km from Beroroha to Bevoay, we'll neither hear nor see a vehicle or any sort of machine, except for an occasional airplane. The 160 km is a physical challenge that will give a real sense of accomplishment, as well as enhance fitness, and stimulate the appetite for tasty meals prepared on the open fire. From the take-out at Bevoay we drive south to Ifaty, a small fishing village just north of Tulear, to relax at the beachside Vovo Telo Hotel. We relax on the beach, snorkel or scuba dive on the reef and explore the spiny forest with it's unique flora and fauna (95% endemic!). And, of course, great seafood. After a full day in Ifaty, we drive to Tulear for our flight north to Morondava. Our home base for the next four nights is a lovely coastal resort, the Chez Maggie Hotel. Here we have time to enjoy the 'mora mora' pace of this friendly coastal fishing town. 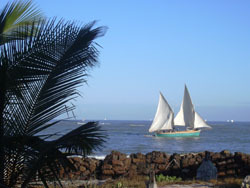 Along with relaxing on the beach or by the swimming pool we have time to explore Morondava, paddle in the nearby mangrove swamp, sail on the Mozambique Channel and sample the the excellent cuisine of the Chez Maggie. 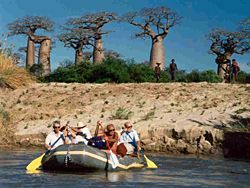 From Morondava we�ll travel north to visit the extremely rich Kirindy Forest Reserve with time at the world famous Avenue of the Baobabs. Following our time in Morondava we return to the capital and complete our visit to the Great Red Island with a sunset farewell dinner celebration with live music at Grill du Rova overlooking the city.